This effective Steelhead pattern by Nick Pionessa. With Nick’s detailed instructions, you have the foundation for an endless combinations of colors and materials. This week’s typing tip is in response to a question by Hatches reader, Nick S. from Boise, ID. Nick wanted to know if we had any suggestions for a small, lightweight fly tying vise to use streamside, or on backcountry fly-in/ hike-in fly fishing trips. Called the “bobbin of bobbins,” Marc Petitjean’s “Thread Through Bobbin,” aims to solve a few classic design limitations of standard bobbins. With rubber legs showing up in more and more fly patterns, one common problem fly tier’s are facing is that they get in the way when tying a whip finish knot. 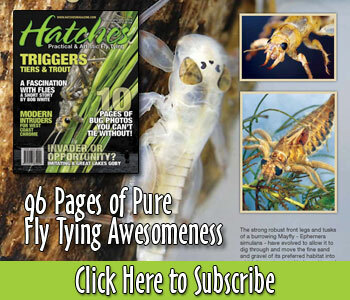 In this week’s Tying Tips, Hatches Magazine staff member Alex Cerveniak shares three quick and easy ways to keep those rubber legs out of the way. Brian Carson of Clear Cure Goo demonstrates how to tie a Polar Minnow using Clear Cure Goo to build the head.